Rain in Ravello with Caroline. Based at a modest agriturismo farm in San Lazarro, I joined a dozen nice Brits for hikes around the Amalfi Coast. 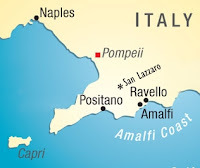 I'd always wanted to see the seaside towns in this famous part of Italy and, although the week's weather was colder, wetter, and foggier than ideal, it was a good visit overall. Entering Amalfi, still sweating after hiking down a steep 1000 meter descent. Amalfi from the mountains above. On Amalfi's small patch of flat land sits its big, beautiful, unusual (Arab-Norman Romanesque?) cathedral. The harbor on the pretty island of Capri. The so-called "Walk of the Gods" to Positano was, minus the panorama, "Walk in the Pretty Fog." When we got to Positano the fog had lifted and photo ops were everywhere. Still too cool and cloudy for most sun worshipers. Cannot resist this kind of shot. Ruins of Pompeii in the shadow of dastardly Mount Vesuvius. Pompeii had less mosaic art than I expected. Much of it has been taken to museums in Naples and elsewhere. 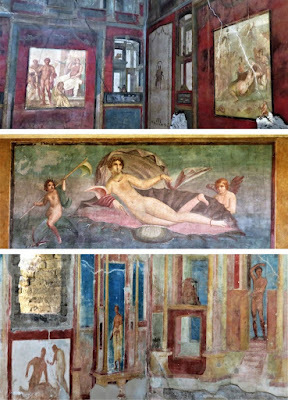 However, a few surviving, surprisingly vivid frescos could be found. For me, the most remarkable thing about Pompeii was its size ― over 170 acres (65 hectares) ― yet, no viewing tower lets you survey the big scene. A 5€ tip got me up to a second floor view for this furtive photo of the Forum surrounded by temples of Apollo, Jupiter, and more. Much higher would be great. 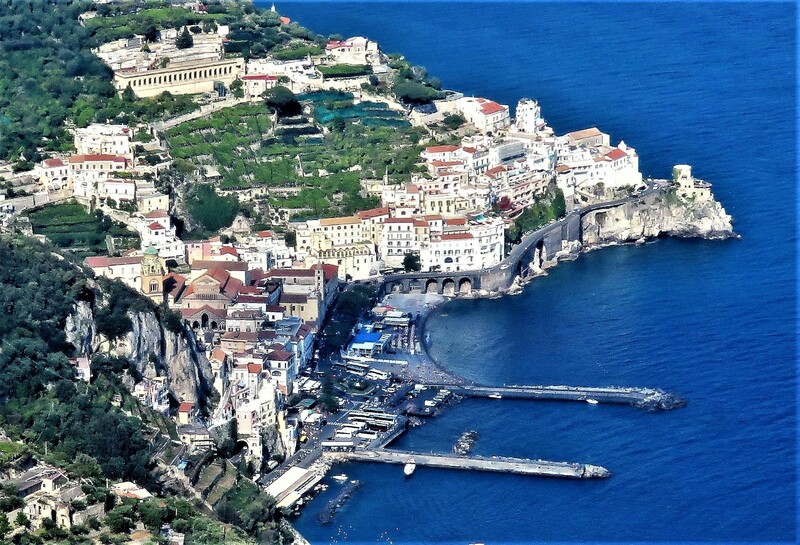 My favorite town was Ravello. It helped that the light rain kept many tourists away. Here is Ravello's main piazza viewed from the church. Villa Cimbrone is perched at the end of ridge with stunning views on three sides. Sometimes clouds added a theatrical touch to views of the old Italian landscape. Ordinary villages like San Lazarro had their charms too and were invariably ringed by olives, grapes, and lemons. From early morning to late afternoon, we kept coming across, working hard in the fields, the 86 year old grandmother of the clan that operated the agritourismo farm where we stayed. Friends said skip Naples but I wanted a glimpse. Could Naples really be so trashy and graffiti-filled? Sadly, Napes deserves its bad reputation. It is indeed thoroughly dirty and thoroughly defaced with graffiti, even on fountains and statures. Amid the thousands of dull vandalisms are a few better ones. The least bad one that I saw was "Worn Zeal," whatever that means. Like all Italian cities, Naples does at least have lots of grand churches. This one is Chiesa di Gesù Nuovo.